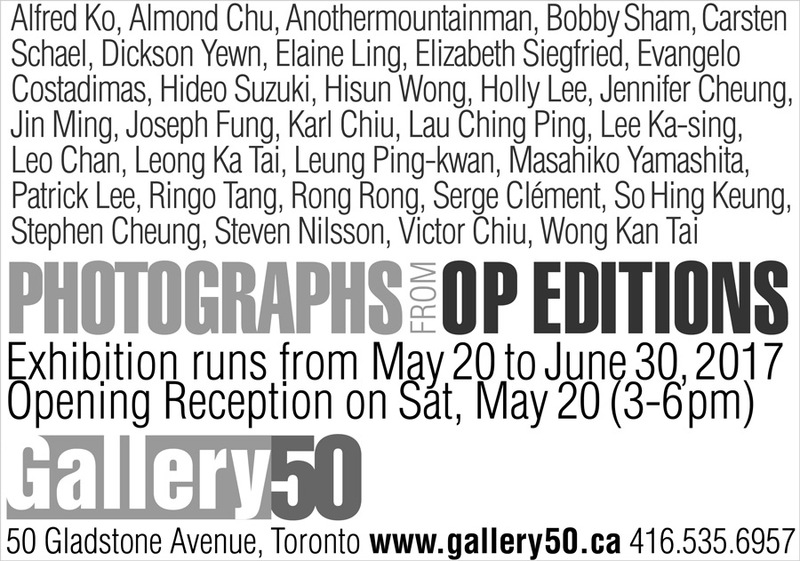 OP Editions (1995-99) was a curated, limited edition print program initiated by Lee Ka-sing (now founder of GALLERY 50) in 1995, two years before he moved to Toronto from Hong Kong. The original idea was, for each selected work, the participating photographer had to submit a limited edition of twenty 8x10 prints. Black and white photographs printed on fibre-based silver paper, whereas, colour works printed as c-type prints. Material used also included Polaroid transfer and Ilford-chrome. All prints were signed, and authenticated with an OP blind-stamp. Photographers could exchange prints among themselves, with part of the editions to be collected by the public. Over the four-year period, the work of many contemporary Hong Kong photographers, including a number of overseas photographers were featured and included in this collection. After two decades, most of these photographers have been well recognized. In fact, 80% of the photographers in this exhibition have work in the collections of more than two museums. This significant print program is a hidden gem. In its unique way, OP also recorded the rise of contemporary photography in Hong Kong and its heyday. After Lee moved to Canada, he extended this print program to include a number of Canadian photographers such as Elaine Ling, Serge Clément, Elizabeth Siegfried, Katherine Knight and Michel Campeau. Among the hundreds of works collected over the years, only a small portion of the OP Editions is featured in this exhibition. We want to emphasize that, this is a SPECIAL occasion. Editions in this exhibition are offered at prices that are 40% of their current market prices (some even below). On-line purchase is not available.